In Russia, it’s been hard to keep a job for life during the tumultuous history of the past hundred years. But one small group of scientists has managed it. Their jobs-for-life have actually been jobs-for-death, because they’ve had the task of looking after the embalmed corpses of Vladimir Lenin, the first leader of the Soviet Union. When he died ninety-two years ago, no-one would have guessed that nearly a century later he would still be lying in Moscow, preserved in a glass coffin under carefully controlled conditions of temperature, humidity and lighting. Millions of people have visited his last resting place over the decades, but the preservation of his body was actually an afterthought. He died in January 1924, deep in the harsh Russian winter, and the freezing temperatures meant that for many days his body could be placed on public display in a wooden mausoleum built on Red Square. Then the mercury slowly began to rise and the communist leadership decided that he should be permanently embalmed. Lenin was regarded in the new Soviet Union as one of the greatest men who had ever lived. Karl Marx had dreamed of the glorious communist future; Lenin had made those dreams reality in the largest nation on earth. He had overseen a revolution, skilfully manoeuvring the Bolsheviks to power, then defended his new state against the many enemies who fought to overturn it during the bitter Russian Civil War. In 1918 he had even survived an assassination attempt, as though his destiny and will were too powerful to be deflected by the actions of mere mortals. But in fact he never fully recovered from his wounds. His health slowly declined and his grip on power had loosened before his death. He tried to prevent Josef Stalin succeeding him as leader, but his failure led directly to his ninety-two years lying as a secular icon in the heart of Moscow. Whe+n he passed away, Stalin saw how he could exploit Lenin’s prestige both to assist his own bid for leadership and to strengthen the power of the party. If Lenin were embalmed and placed on permanent public display, he would become a powerful symbol of communist science and technical prowess. Two skilled chemists, Professors Vladimir Vorobyov and Boris Zbarsky, were given the job and no doubt trembled at the responsibility that had fallen on them. Their success ensured their continued liberty and good health. 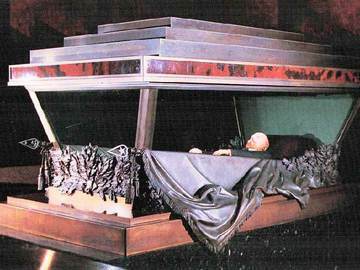 They were the first men in what might be called a “’balmy army” – the team of scientists, architects and engineers who were given the job of looking after Lenin’s preserved corpse. By 1930 Lenin lay in a specially built granite mausoleum, dominating Red Square and attracting communist pilgrims from all over the world. He helped cement Stalin’s grip on power and when Stalin died in 1953, he too was embalmed and placed beside the man whom he had hailed as the “genius of geniuses”. By then Lenin had lain in state for twenty-nine years; Stalin wouldn’t last a single decade. There was a slow but irresistible reaction against the cruelty and tyranny of his reign and in 1961 his embalmed body was removed from the Lenin mausoleum and buried elsewhere. There has never been a similar reaction against Lenin, although many have argued that he too was a tyrant, laying the foundations of Stalinism during his own reign. Indeed, Lenin is still regarded as a hero by large numbers of Russians and the Russian government continues to fund the team of scientists who monitor his embalmed body for deterioration. Every eighteen months it is temporarily moved to an on-site laboratory, where it is washed and re-injected with embalming chemicals. Then it goes back on public display. Soon it will be the hundredth anniversary of Lenin’s death, but will he still be in his glass coffin to greet it? When the Soviet Union collapsed in 1991, there are demands that the Russian government should finally follow the wishes of his widow Krupskaya, who had wanted him buried, not embalmed. It didn’t happen and Lenin is still where he has been for so long, on public display in the heart of Moscow.